-35° 22′ 14.5452″ (-35.370707 deg), 149° 25′ 28.7682″ (149.424658 deg). The East-West arm slopes 11.854 arc minutes to the west, and is rotated by 4.9 arc seconds relative to true E-W. The astronomical azimuth is 90° – 4.9″. 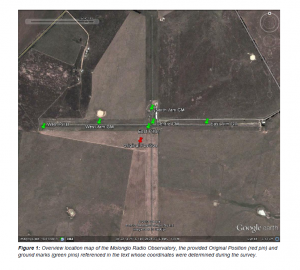 Note that the Google Earth image of the site from the 2012 survey accounts for the change in the definition of geodetic coordinates between the 1960s and 2012. The 1963 survey by Cook was done from astronomical measurements, relative to FK4 stars of Fricke et al. (1963). The telescope has not, in fact, moved by 160-odd metres!